900 Watt Propane Inverter Generator is rated 4.8 out of 5 by 42. Rated 4 out of 5 by ktmxrider209 from Light weight quiet and I bought this little generator from home depot on sale for $199. When I go camping I need something to keep batteries charged and to run a few lights. The 900 watt propane generator appealed to me for a few reasons, 1 the compact light weight design is great for tent camping when you don't need the bigger 2000 watt generators. The 2nd reason is the propane powered. Being I will primarily use this for camping it's going to sit for most of the year the propane systems will last longer and not clog up because of stagnant fuel. 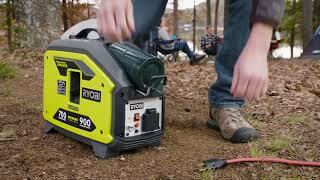 Overall this generator is perfect for the occasional camping and running some light equipment. Rated 5 out of 5 by Sonoma from 900 watt propane I thought about buying the small Sportsman but bought this because of the propane. Easy to use and start. Have only used it once but satisfied my needs when I went dry camping. Looking forward to using it again knowing that it took care of what I wanted it to do ! Lightweight enough for the wife to use too ! Others have mentioned the oil - 8.4 oz bottle but the refill is 10 oz. ?? I'll watch the level and change it after a few more uses. The little plastic bag holding the screws broke open and had to fish them out of the bottom of the unit but no missing parts. *maybe a 12v + USB port would be helpful but not a deal breaker for me! Rated 5 out of 5 by Jimmzer11 from Versatile, lightweight.. I bought this unit because I do a lot of dry camping. (No power) and this model is perfect for charging my RV batteries when my solar can't be used. Running on 1 lb. Bottles is so convenient for me, and the unit is also very lightweight and quiet to run. The ability to run longer on a 20 lb. Tank is also a plus! 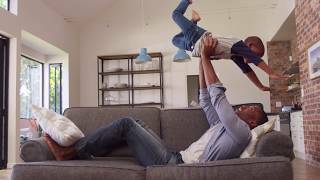 Unique product, well worth the purchase. Recommended to all RV'rs. Rated 4 out of 5 by Caretaker from Really Useful I use it to power a sump pump which is a long way from any power outlet. (I pump out a basement periodically in a property with no power.) The 900 watts lets me power a 1 HP pump. I wish it were 1200 watts so I could use a larger pump. But it is both quiet and light weight. I like it! Very useful! Rated 5 out of 5 by Frankie D from Ryobi 900 propane generator portable This is my second generator that I have purchased made by Ryobi. I am very please with the performance, Low noise level and affordability of the product. Rated 4 out of 5 by Gator Gee from Quiet, light weight and perfect for occasional use I purchased this inverter because of the ease of using propane, and the fact that it can handle all of my basic needs in the event of power failures. 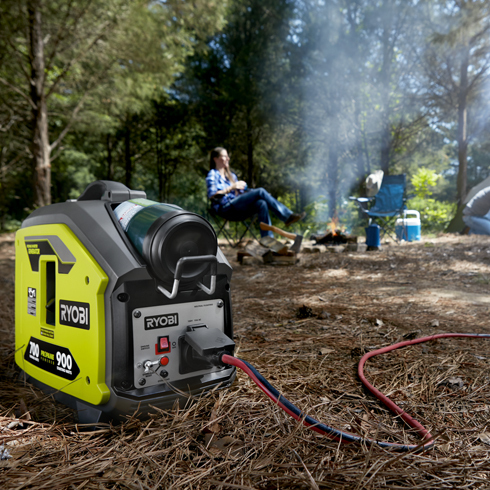 It is easily portable and quiet compared to other generators/inverters. I also purchased a UPS with battery backup which I installed for all of my electronics as additional insurance for power failures. I'm very happy with the purchase of the Ryobi inverter. 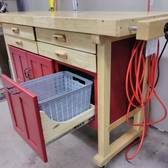 Rated 5 out of 5 by Paw Paw P from Good for when there is a short power outage Easy to use. 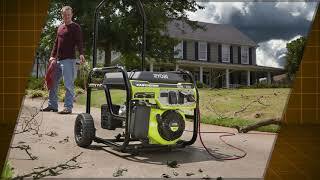 Don't need to pull out the generator for short outages. Enough power to run a fan, light and TV.